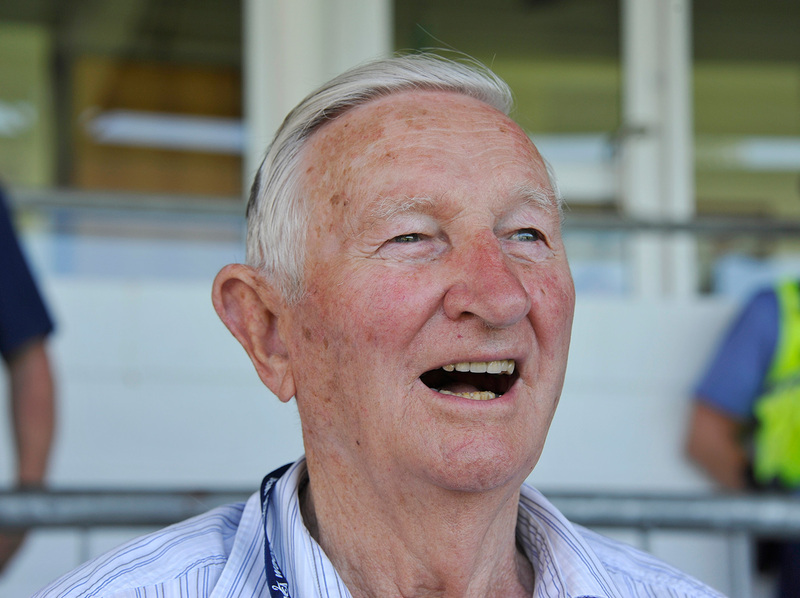 If you have ever watched a Sheffield Shield game at the WACA in Perth, you may have seen him - an elderly gentleman strolling back and forth between his two favourite viewing positions at square leg and behind the bowler's arm. 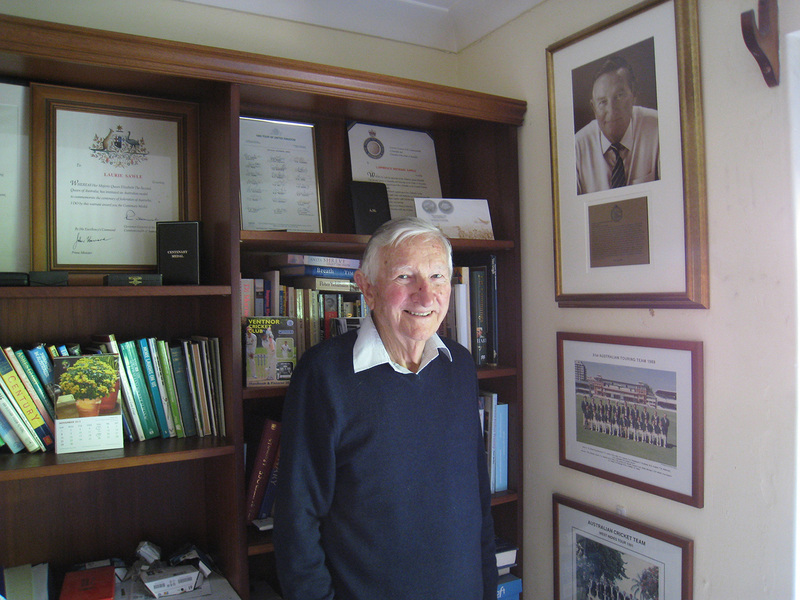 You could walk right past this humble retired schoolteacher without knowing that he was one of the greatest contributors to Australian cricket's success over the past half-century, a man who Steve Waugh regards as "a source of inspiration". His name is Laurie Sawle, but everyone in Australian cricket calls him "Colonel". From 1962 to 1980, he was a Western Australia selector, handing first-class debuts to the likes of Dennis Lillee, Rod Marsh, Kim Hughes, Terry Alderman, Bob Massie, Ross Edwards and John Inverarity. 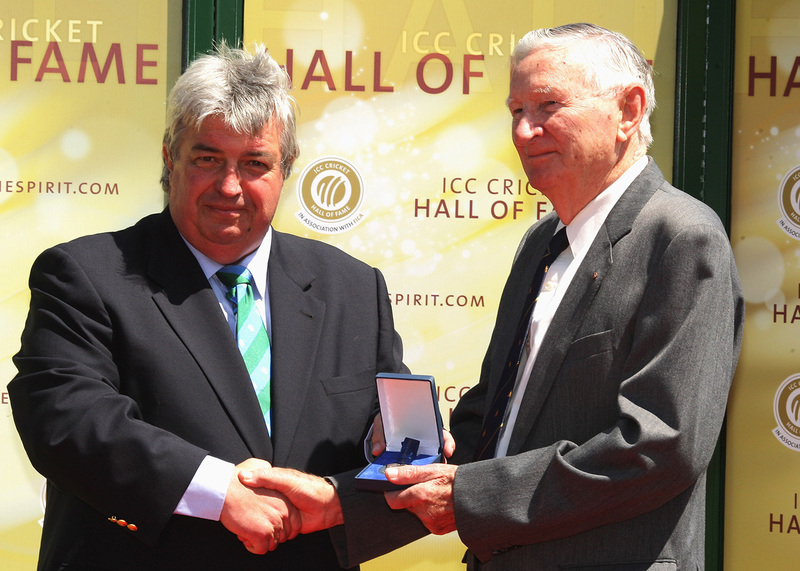 From 1982 to 1995, he was an Australian selector - and he was the chairman of the selection panel for 11 of those years. Here is a shortlist of Australians his panels gave Test debuts to: Steve Waugh, Mark Waugh, Mark Taylor, Ian Healy, David Boon, Michael Slater, Shane Warne, Glenn McGrath, Craig McDermott, Damien Fleming, Damien Martyn, Justin Langer and Matthew Hayden. If what the historian Gideon Haigh called "the green and golden age" had a lead architect, it was the Colonel. On the first morning of the first Test of the Australian summer, I journeyed to a single-storey, red-brick house in the southern suburbs of Perth to meet him. He greeted me in the living room with a friendly grin and a warm handshake. He is 90 now but doesn't look it - his neatly cut white hair combed sensibly to his right is still streaked with black, and his blue eyes are bright and alert. His TV, a small flat-screen Sony, was switched on and tuned to Channel Nine: Australia's new opening partnership of David Warner and Joe Burns had steered their side to 0 for 60-something at the Gabba. He switched off the TV and we pulled up two comfy armchairs to the coffee table to discuss his wonderful life and his extraordinary 56 years of service to his state, his country and his country's national sport. A self-described "stubborn opening batsman" for Western Australia (WA), Sawle retired from first-class cricket at the end of the 1960-61 season, finishing his playing career at the age of 35 with a modest record of 1701 runs at 28.83. His memories of that life-changing summer remain crystal clear. "Well, I thought about that for a moment and I thought …"
Sawle trails off for a moment, reluctant to take a potshot at the unnamed selector, even more than half a century after their fateful conversation, before continuing: "I put my name [to the cricket committee of the WACA] for nomination [as a WA selector for the following 1961-62 season] at the appropriate time and I was appointed." The 18-year-old Inverarity was picked to make his Shield debut before the midway point of Sawle's second summer as a WA selector. By the end of the decade, Inverarity was joined in the side by Dennis Lillee and Rod Marsh. Sawle had first noticed Lillee bowling in grade cricket in the mid-'60s. "He was a very raw, tearaway, young aggressive fast bowler for the Perth club when he first came in," says Sawle. "His sheer aggression and pace just grabbed you. It was unusual in that era." When Sawle became a selector, Western Australia, isolated on the far side of the continent, was still regarded as a second-class state in Australian cricket, having only won the Shield once. During Sawle's 18-year tenure as a state selector, WA became the dominant force in Australian cricket, winning the Shield six times and the domestic one-day title four times. They played a brand of cricket that could only be described as Australian par excellence - aggressive, attacking and winning, even when conventional logic suggested that such an outcome was far-fetched and fanciful. In no match was this more evident than the one-day semi-final against Queensland in 1976. Having lost the toss and been sent in to bat on a lively WACA pitch, WA were promptly rolled for 77 in two hours. With Queensland boasting, as Sawle is quick to remind me, two of the finest batsmen of the era in Greg Chappell and Viv Richards, WA's cause seemed hopeless. Marsh, their captain, rallied his men during the innings break: "There's a big crowd here. Let's not let them down. Let's make 'em fight for it!" Lillee backed him up with both his words - "Make 'em fight for it, be buggered. We're going to beat these bastards!" - and his deeds, bowling Richards for a duck and nicking Chappell off for two, in a match-winning spell of 4 for 21. WA triumphed by 15 runs and went on to defeat Victoria in the final at the MCG. In 1984, with the retirements of Lillee, Marsh and Chappell, Australian cricket entered the deepest, darkest trough of its 106-year history. Over the next five and a half years, they would win seven Tests out of 46, lose a Test series to New Zealand for the first time, and fail to mount even the faintest challenge for the Ashes surrendered in 1985. Sawle understood the value of patience. As a teenage infantryman in the 7th Australian Infantry Battalion during the Second World War he "spent the final 18 months" of the war "extending out into the jungles" of the interior and south and north ends of Bougainville Island, where 40,000 Japanese troops had retreated. With the Imperial Japanese Army in no mood to surrender, 516 Australians were killed in the campaign, 35 of them from Sawle's battalion. When he returned home, it took him nearly eight years of grade cricket (including three on the state practice squad) to earn his first-class debut at the relatively ripe old age of 29. Throughout Australian cricket's mid-'80s recession, Sawle and his co-selectors stayed calm, having already planted the seeds for an Australian revival. In 1983, as chairman of the Australian Cricket Board's (ACB) youth sub-committee, Sawle reorganised the national Under-19 tournament so that, in the words of Gideon Haigh, it "set a new standard for sophistication and labour intensity". The "first thing" he did was to insert two-day cricket into the fixture list - each team would now be required to play three two-day games in addition to four one-day games. "You've got to give the young lads a chance to build an innings and play long innings," Sawle thought, "so they can bat most of the day if they want to. That's what they've got to do later." He applied the same reasoning to developing bowlers. Second, Sawle made himself the chairman of the selection panel that picked the Australian Under-19 team at the end of the national carnival featuring the six state Under-19 teams. Third, he arranged for Australian age-group teams to be sent on what were called youth tours. "I remember Zimbabwe was one. New Zealand another. We'd expose them to a higher level of competition." It was on an Australia Young Cricketers tour of the West Indies in 1990 that a 20-year-old Shane Warne would first emerge. In 1984 - the year in which he ascended to the chairmanship of the Australian selection panel - Sawle, a schoolteacher by trade, retired after more than three decades of service in the WA state school system. "And that's when I started full-time," he chuckles, "another life." For the next 11 years, he criss-crossed the vast Australian continent to watch Test, Shield, grade and Under-19 cricket. Fortunately - for Sawle and Australian cricket - his wife Lorna was originally from Melbourne, so her husband's trips to the eastern seaboard presented a good opportunity to visit family. The ACB was not paying Sawle for his services as a selector (although they were covering his travel and accommodation expenses). Thus, at a practical financial level, it was his WA Department of Education superannuation that enabled him to render his services to Australian cricket. Like all Australian cricketers and administrators of his era, Sawle was used to little or no pay - the players, Sawle cheerfully recalls, got paid "about two pound a day" to play cricket for WA in his day. The trouble was, because he had to take unpaid leave from work in order to play, "it was a struggle on the purse". Fortunately he and his first WA opening partner, John Rutherford, happened to teach at the same school: Kent Street High School, near the WACA. On a Shield day, Sawle says, "Ruther and I… would go to school and teach the first two periods, which would take us up till 10 o'clock, jump in the car, rush down to the WACA and open the batting at 11!" Although this limited their pre-match preparation to "a couple of throwdowns" if time permitted, it allowed them to collect a third of a day's pay for teaching the first two periods. This meant that, over the course of a four-day Shield game, they were able to get two-thirds of a day's teaching pay (days two and three typically fell on a weekend). More than 60 years later, as he tells the story with another of his many warm and self-deprecating chuckles, Sawle still remembers precisely how long the drive from Kent Street High School to the WACA took them: seven minutes. Back in the early 1980s, there was no National Cricket Academy, no National Talent Manager, not even any state 2nd XI cricket. The national Under-19 carnival "was the only place that you could identify" young talent, which is why Sawle didn't miss a carnival for nine years. In 1982-83, he recalls, "the Under-19 tournament was in Perth… and a young keeper was outstanding" with both bat and gloves. The "young keeper-batsman was named player of the carnival and his name was Ian Healy". The following year, "we had this great luxury of unearthing Stephen and Mark Waugh and Mark Taylor - all in one year [from the same New South Wales Under-19 team]. And they were just outstanding". Steve Waugh, Sawle says, "had that steely resolve. He valued his wicket. And in bowling, you could see the concentration. I was very impressed." On a technical level, "he could play off the back foot" and had that "drive through the covers off the back foot reminiscent of Norm O'Neill, one of the first players to play that shot". Twin brother Mark was "just a delightful, graceful" batsman and person with "marvellous" technique. Taylor "had … the ability to open the batting" and "looked all over captaincy material". Even with all that talent in the pipeline, further major reforms would be needed to lift Australian cricket from the doldrums. Sawle expressly declines credit for the second of those reforms - the establishment of the world's first national cricket academy in 1987, which he says was driven by the board and the administrators, but he cannot deny himself credit for the first. 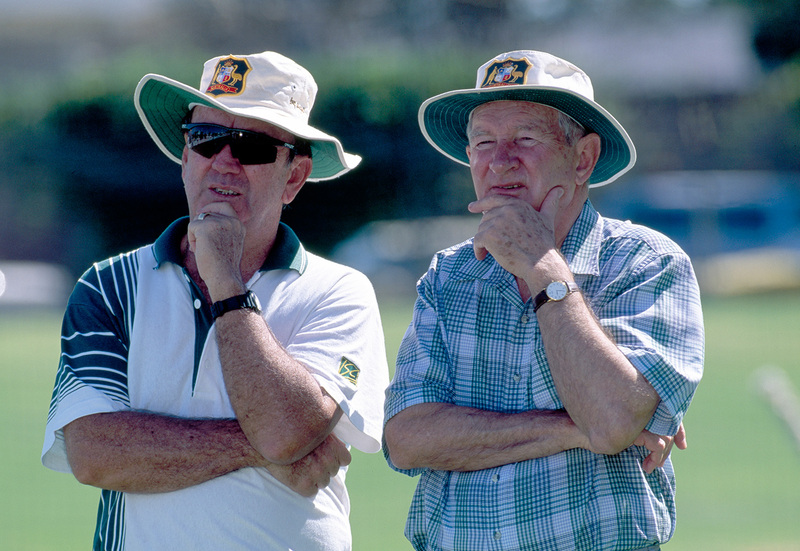 In 1986, as chairman of selectors, Sawle successfully made the case at an ACB executive committee meeting that Australia should appoint a full-time national coach and offer the job to Bob Simpson. His reasoning was clear. "I thought that the captain's duties were increasing, the game was getting more professional and there were more practices… more things to attend to and the captain had his hands full. Allan [Border], at first, as you know, was a reluctant captain. It was unnatural for him to organise everything." Simpson took primary responsibility for off-field and training matters, thereby allowing Border to focus on and grow into his role as an on-field leader. Sawle chuckles as he recalls that Simpson had the Australian team "working their backsides off in the field" with immediate results - the pre-tournament underdogs were the best fielding side at the 1987 World Cup and went on to stun Pakistan in the semi-final and England in the final. "Over the period of Border's captaincy, not enough credit was given to Bob Simpson for the role and contribution he made," Sawle says. "He was terrific." Without him Border would never have been able to develop from "a reluctant captain" into "one of the best". The 1987 World Cup win was the first clear spark of a revival, but it was the 1989 Ashes tour that marked the definitive end of Australian cricket's recession. "Ruther and I would go to school and teach the first two periods, which would take us up till 10 o'clock, jump in the car, rush down to the WACA and open the batting at 11"
Sawle, in addition to his role as chairman of selectors, was appointed team manager for the tour. Before they left they had hoped to do well, but he had no inkling that they were about to crush the old enemy 4-0. Nor did the old enemy. At the end of the Australians' first press conference in England, a local reporter asked: "Mr Border, we don't want a six-match whitewash. When England are 3-0 up, would you ask for reinforcements from Australia?" "See, up till then, most of the games before we left Australia, the opening bat pairing was [Geoff] Marsh and [David] Boon. I worked on Simmo and AB to give Mark Taylor a shot [as opener with Marsh] because I liked the left-hand, right-hand combination, and I knew that Boon was the perfect No. 3: solid as a rock or could explode if he wanted to. So we worked on that, and we did play Tubby against the West Indies in a couple of games before we left Australia. It didn't do me much good because he didn't make enough runs! "So we got to England and the county games took place and Tubby had to make [a score] before the first Test. He made a very nice 60 or 80. Come selection, I kept up this thing about 'You know, I can see Boon being a better No. 3, I can see Border being a better four than No. 3, Dean Jones was the perfect No. 5 and Steve at No. 6.' So it took us a long, long, long discussion before we got AB [who, as captain, was a selector on tour] to come around. And I could understand that because Boon and Marsh were a great partnership. They'd done very, very well for AB. Anyway, he did finally agree to break it up and you know what happened - Tubby got a hundred in the first Test!" Australia triumphed by 210 runs at Headingley and Sawle realised that their team was going to do something special. "It flattened the English team," he says. "They were absolutely stunned and disorganised after that. They didn't quite know what struck them. Terry Alderman, who was a tremendous swing bowler, they didn't do their homework on him - they thought all he could do was bowl outswingers and straighten it. Of course, he had developed an in-dipper as well. That's why there was lbw shouldering arms!" The 1989 Ashes top six, handpicked and arranged by Sawle, remains, by some distance, statistically the best Australian batting line-up in England across eight Ashes tours over the past 26 years. The per batsman average of the permanent members of that top six was an astonishing 66.85. The next best was the last that Sawle picked - the 1993 side that averaged 55.96. The equivalent averages for Australia's other Ashes tourists over the years: 35.62 in 1997 (a wet English summer), 55.33 in 2001, 33.93 in 2005, 45.96 in 2009, 34.36 in 2013 and 37.51 in 2015. The 1989 Ashes tour marked Steve Waugh's arrival as a Test batsman. Three and a half years after his debut, in his 27th Test, Waugh scored his maiden Test century - a series-defining, unbeaten 177 at Headingley. Sawle was the first person he thanked. His exact words: "Thanks for sticking by me and giving me the chances." Sawle acknowledges what many in Australia had been saying (and would keep saying until the end of the 1993 Ashes tour) - that his selection panel gave Waugh a longer chance than some. But he explains, "The others didn't have the all-round ability that Stephen had to maintain his place in the side as the balancing player, batting at six and bowling his overs." It was a time that called for cool heads in the selection room. People with vision and intuition were needed and, thankfully for Australian cricket, Lawrie Sawle, a former Western Australian opening batsman of patience and perseverance, was in charge. Post-Waugh, Sawle would go on to play a big role in the emergence of two other all-time greats. All through the '80s, as the West Indies' four-pronged pace attacks ruled world cricket and some feared the extinction of spin, Sawle and his panel's belief in quality spin bowling - in particular, legspin - never wavered. Internally, at their selection meetings, they kept "crying out for legspin". Naturally they did not hesitate to pick - and, crucially, stick with - a 22-year-old Warne when he had barely established himself in Victoria's Shield XI. Sawle gives all the credit to a fellow selector, a Victorian who was one of Australia's better legspinners in the post-Benaud, pre-Warne era. "Jim Higgs and the Victorian people, they identified him first from their grade cricket and they were very excited about him." In November 1993, Sawle's panel picked 23-year-old Glenn McGrath to make his Test debut because "length is everything in bowling". Seventeen months later, with Taylor as captain, the Waugh twins leading the batting unit, and Warne and McGrath leading the bowling attack, Australia defeated West Indies in the Caribbean to end their 15-year reign as the undefeated Test champions of the world. That year Sawle retired as a national selector after 13 years of unstinting service, having ushered in the green and golden age that would last for another dozen years. Two decades after his retirement as a national selector, Laurie Sawle's love for the game remains undimmed. His interests are walking, golfing and watching as much cricket as he can. He still goes to every Test and Shield game at the WACA. When the current chairman of the Australian selection panel, Rod Marsh, visits the WACA to watch Shield games, they sit together to take in the action. Sawle remains a self-described "traditionalist", but he's no stick-in-the-mud. He watches the Big Bash from the comfort of his lounge and "enjoys it". His knowledge of current players is impeccable and he remains a firm believer in the Australian system. "I've always got faith in the Australian players because Shield cricket is a wonderful base," he says. "Those [players] that use it properly and are consistent and are given the opportunities can [enable us to] build up a good side again." Just before I leave, I tell him that, as someone who grew up in the '90s and watched the wonderful Australian teams that he and his panel handpicked, it was a privilege and a thrill to chat with him. "A pleasure", he replies gracefully, "I always enjoy talking about cricket!" Then, for the first - and it's safe to say, only - time in my life, I get to experience what it was like being a young Steve Waugh. Laurie Sawle kindly pats me on my left shoulder and says, "Good on you".